Learn about a variety of ultraviolet lights in this section. 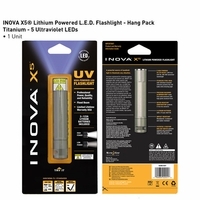 We have name brands like Inova, Spectroline and Streamlight as well as generic imports from the East. Ultraviolet light products are very useful tools in detecting fraud, forgery, counterfeit money and art as well as detecting leaks and stress and rodents or scorpions. There are numerous forensic uses as well as germ sanitation to maintain one's health.